There are two main places to see the lotuses in Gyeongju: outside of Anapji Pond and near Cheomseongdae Observatory. The Anapji Pond area is really convenient because parking is available close by, but the main show is at the Observatory. 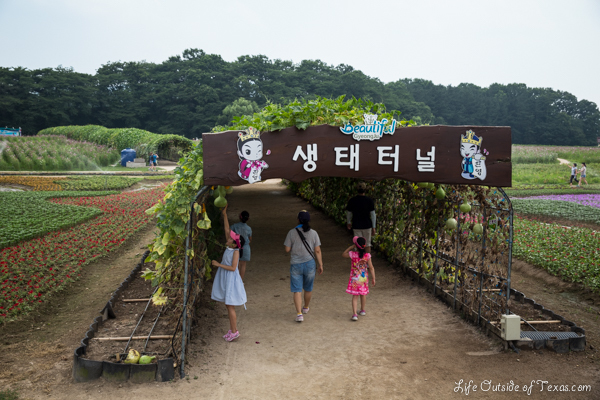 If you head to Cheomseongdae Observatory, it’s a lovely place to see other types of flowers. Mexican Asters (garden cosmos flower) bloom around the same time as the lotuses and the observatory area has an entire field of these gorgeous flowers. There’s also a really nice tunnel of gourds that you can walk through. The gourds grow up and over the tunnel and hang down from the top. It’s absolutely lovely. The Cheomseongdae Observatory area is one of the main attractions of Gyeongju and it’s one of my favorite places to see in Korea. It is full of burial mounds and happens to be one of my favorite places to see cherry blossoms in spring. It’s a photographer’s dream and a great place to enjoy the outdoors and soak in the beautiful scenery. The lotuses start blooming at the end of June and reach full bloom around mid to late July. The dates vary each year. This entry was posted in Gyeongju, Gyeongsangbuk-do, Summer and tagged aster flower, cosmos flower, flowers photography, lotus pictures, places to visit in korea, south korea information, south korea tourism, south korea tourist attractions, things to do in Korea, visiting south korea by Meagan & Dave | HappilyEverExpat.com. Bookmark the permalink. Wow this looks so pretty! I wish I’d known about it sooner so I could plan a trip to see it this year! But you’re right, Korea has so many gorgeous nature places to visit, I don’t know how anyone could complain about there not being green spaces! The lotuses are so beautiful! Most cities have a lotus pond or two so if you are around next year you should definitely check one out. Gorgeous! I said this about one of your Gyeongju posts before, but: HOW THE HECK DID I MISS THESE PLACES! Granted, it was in winter, so maybe they weren’t so appealing then. Your lotus photos are wonderful! It’s easy to miss things in winter because everything gets so brown and kind of ugly. If you’re back on the mainland in spring or summer then you’ll definitely get to see a lot more of the pretty stuff! You’re right in that many people don’t ever really leave the big cities. I, for one, cannot stand to go more than a few weeks without seeing some real greenery. These blossoms definitely qualify! I get out of the city as often as I possibly can! I love the Korean countryside. You really see the big picture when you venture outside of the cities. Oh wow! These photos are absolutely beautiful! I love the shot of the couple under the tunnel of gourds. 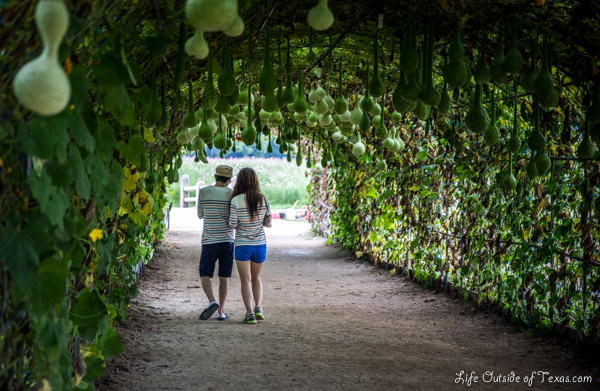 Who knew gourds could be so…..romantic? The gourd tunnels are so cool! It’s interesting how early everything bloomed last year. The cosmos and gourds are only just now blooming this year (a month later than last year). I certainly agree with you. Korea has some great green space and right now is one of the best times to get out and see it. I really loved those pics of the lotuses. Not sure if we have anything similar over here on the southwest side. Thanks for sharing. Really? Then you gotta get over here to the east next year to see the beautiful lotuses. 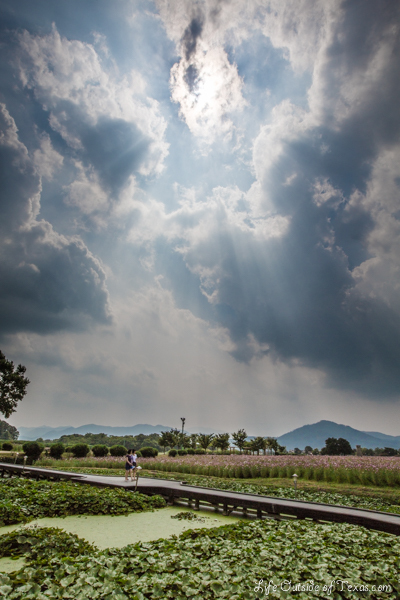 Plus, Gyeongju is well worth the trip if you haven’t already been. We’re working out an east coast trip atm but might focus on Gyeongju for a later journey. How is it in Fall/Winter? Gyeongju has plenty to do for it to be an independent trip. I love summer there because everything is so green, but the colors in fall are really nice in Gyeongju (or so I’ve heard). Noted. Thanks for all your info. I’m so happy there are people out there like you that are so helpful and kind. No problem! If we are ever back in your neck of the woods I’m sure I’ll have plenty of questions for you. If you need any help planning your trip to the east let me know. Thanks, Anna! This is one of my favorite places in Korea for sure. Your pictures are so pretty! I personally can’t stand the humidity of summer here, but that’s because I’m a sweat monster like no other, but I actually did just think to myself this morning on my walk to the subway how green the trees were and thought they were so pretty. I’m also always so damn happy every time I leave Seoul because Korea really really is super stunning and green once you get out of the huge cities. How’s the weather in Seoul today? It’s absolutely gorgeous today with an amazingly beautiful blue sky, but super hot (about 90). The heat doesn’t bother me as much as the winter here. I’m from Texas so I’m used to really hot summers, but I’m a big wimp when it comes to cold. I agree with the mentality that people think it’s a concrete jungle. I came here by myself thinking I would be close knit with my coworkers and friends, only to hear them complaining about Korea and that there is nothing to do. There is a ton of beautiful country side that is really quite stunning. Although I must confess, not quite sold on the beaches :). But that pink photo, what a treasure that one is! Great job. Thanks! I agree with you on the beaches. They aren’t really that great. I guess the suffice since the Koreans only spend 2 months a year on them. I’ve heard the beaches in the northeast of Korea are the best, but I haven’t checked any of them out yet. The lotuses are so pretty, and your photography of them, wonderful! Thanks for dispelling the perception! Wow, such beautiful photos! I particularly love that first one with the sun rays sneaking through the clouds! Thank you so much, Danielle! It was a beautiful day out and I was happy that we were able to capture the beauty of the lotuses. The lotuses are gorgeous and the photos of the couple and kids under the gourds is unique. I look forward to seeing them. Thanks for the inspiration always of the many things to see and do! I’m glad you enjoy reading about it! We try to see as much of Korea as possible and it can be hard to find time to write about everything we do. Nice comments like this help keep me motivated. Thanks, Lisa! Pingback: Korea, Gyeongju - Bicycling to Anapji Pond!